It's true that time flies when you're having fun. In a matter of days, we'll be welcoming 2012 and I'm excited and scared at the same time. Excited to embrace another chance to make life better and at the same time scared of the unexpected. A lot of good things happened to my nail art blog this year that I am very thankful for and most of my nail art designs have actual stories behind them. Before the year ends, I'd like to share with you my top 10 nail art of 2011. This list is NOT based on page views or popularity. This list is based on those personal stories that accompanied these nail designs, stories that made an impact on my life. I believe this is a good way to reflect on things that happened this year. I painted this nail art to help me cheer myself up from a bad break-up. It was my most personal post to date and I really appreciated all the kind words and support that you all gave me. More particularly, I will never forget a fellow nail artist who sent me an email aside from the comment she left, that gave me comfort. To this sweet lady (you know who you are), thank you. This floral nail art has become one of my personal favorites and if my memory serves me right, I wore this for almost a week. I was very fond of this design because I thought it looked like decals or full nail stickers. I also created my first successful video nail art tutorial using this floral design. It has been one of my fulfilling moments in nail painting. I'd like to recreate this using a different color one of these days. 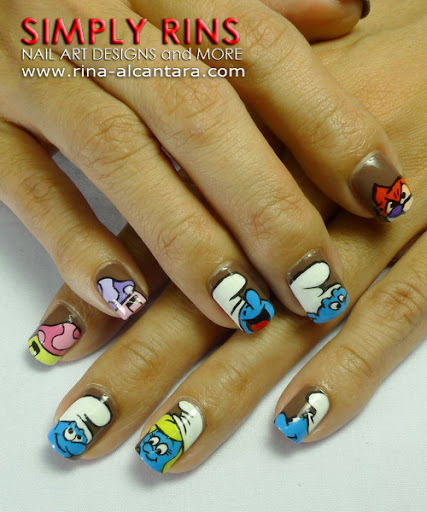 The Smurfs nail art is one of the most memorable and the most time-consuming I've ever done. My parents were away for a vacation at the time I did this. I got busy with responsibilities that it took me 2 days to finish my Smurfs nails! I could have opted to just have an accent nail but I originally wanted to paint something Smurf-y on all my nails and in the end, I was happy with the outcome. The experience taught me patience and it made me realize how much I love nail painting that I was willing to do my nails on installment basis. mind was to paint frogs because it's green! And honestly, those frogs did help me like the color green because after that, I bought a few green nail polishes to add to my stash. The 6th spot goes to one of my Halloween nail designs. One day, I was out and I was looking for a basic orange nail polish. When I found one, I also spotted a neon orange nail lacquer and seriously thought of buying that instead. Well, I did! I know I couldn't carry wearing a full neon orange manicure, that is why I decided on nail tips instead and added spiders to subdue the bright color. I liked how it turned out a lot that I wore this for a full week, during an out of town vacation with my mom and sister. This nail art taught me how to think out of the box. There are times that I felt I needed to always come up with complicated nail designs because I don't want to see people get disappointed when they look at my nails and see something "ordinary". This particularly happens when I'm with people who knows that I am a nail artist. They somehow always like to be impressed. I wore this simple floral design for a cousin's wedding and I decided to think only about pleasing myself. It was the time I realized that we should wear our nails for ourselves. If appreciated, that's great! If not, it shouldn't really matter. These 2 nail designs is a tie for 4th. I've received emails from nail art beginners that expressed that they were having some difficulties. I came up with these designs to inspire them, that something as simple as polka dots can create amazing designs. I was invited to feature some of my nail designs in a local newspaper and in television a few times. Those experiences were overwhelming. 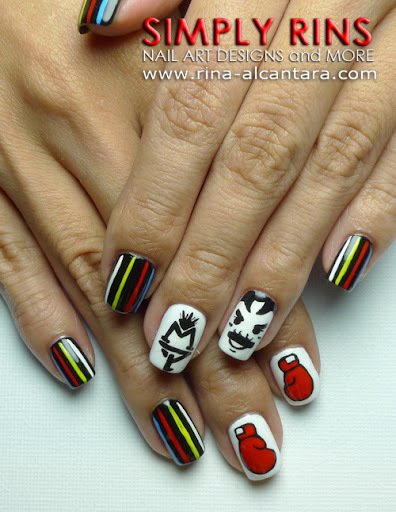 The most memorable is when GMA Good News TV featured me working on a Manny Pacquaio nail art. There were doubts if I was really doing nail art on my nails and this television feature helped me clear the smoke. This Christmas nail design has become one of my favorites too. I wore this longer than usual. 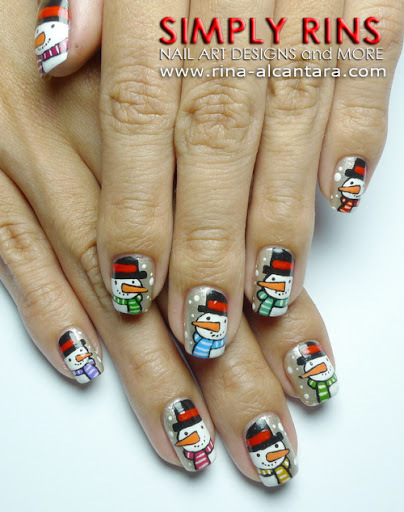 It also inspired a number of fellow nail artists to recreate it for the holidays. But what really makes this Reindeer nail art special is that I received the most emails (via contact form) because of this design and reading those messages is humbling. Reading emails that lets me know how I inspired them is always elevating. Thank you for taking the time to write me. The no. 1 spot goes to those 10 snowmen I did for Christmas. 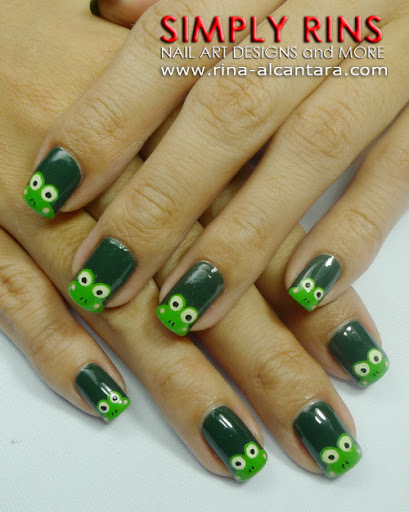 It was the nail design I wore during the Philippine Blog Awards 2011. Simply Rins won Best Beauty and Fashion Blog (Luzon) that night. I think it was the first time a nail art blog was recognized like that and I considered it as a big step to the nail art community. But mostly, it was also the night I was approached by some of my blog's followers and the feeling is simply amazing. It is a pleasure to have met you in person. 2011 was a good year for this blog. Surprising opportunities came and I was able to reach out to more nail art enthusiasts. I'm looking forward to sharing with you more nail designs on 2012, that are interesting, creative, simple, and inspiring. I promise to continuously seek ways on how I can improve this blog. Please join me for another year of nail art designs and friendship by subscribing here. I liked a lot the last you've done! ("FIREWORKS" if I remember correctly). Your nail art are adorable! is an Italian girl (in fact I used the translator to write to you) and follow you for ages, and will continue to do so! *Hugs* kisses and happy new year!! Love the Reindeer ones the best I think....In the future would you mind including some information about how long it took to do some of these designs? i.e. if you say 3 hours that may discourage me from trying similar designs for example! Thanks and keep up the awesome postings, and I'll mosey on over to the contact form and see if we can link or otherwise collaborate across our blogs! Wow! You are AMAZING! I was looking all over for a nail design to do for Christmas, but everything had been WAY overdone! I was reading down a blog list and saw yours, without a picture. So I decided, what the heck.........and when it came up, ah, PERFECT! I painted them on for christmas and got thousands of compliments from my aunts who are also Nail Techs. Since then I added your blog to my reader, and have been reading older posts, there is not one that I don't like, and that is saying something! I really enjoy seeing your posts, they inspire me so much! Thank you so much for all the time and effort you put into your blog! Love every single designs in your blog. Will visit u again very soon; Have a very happy new year!! I liked a lot also Smurfs, Spider Tips, Keroppi Wannabes, but for me they are a little bit more difficult to "wear" every day :)Also, I don't know if I'm able to make them.. Really great works of art!!! Hope to see lot of your new beautiful nail creations!!! I had a blast working on my Christmas nail designs. But December is truly the busiest month and I wasn't able to do some ideas that were suggested. Perhaps this year, I'll be able to do more. They're all beautiful but if I had to choose, I'd make the Smurfs, Snowman and Halloween Polka dots my Top 3! It's hard to choose a favorite, but I like the reindeer and I tried them myself on a Christmas design with Santa and all his reindeer, but mine turned out nowhere near as good as yours. Your designs all look so clean and neat. You are amazing!